Murania Press » The Greatest Adventure Movie. Ever. The Greatest Adventure Movie. Ever. I intended today to post an update on a different topic altogether, but I’ve just finished watching — for perhaps the 30th or 40th time — my all-time favorite film, the one that satisfies me most out of the many thousands I’ve seen in 50 years as a true-blue cinephile. It still appeals to the ten-year-old boy in me, the breathless grade-schooler introduced to it back in the early Sixties. 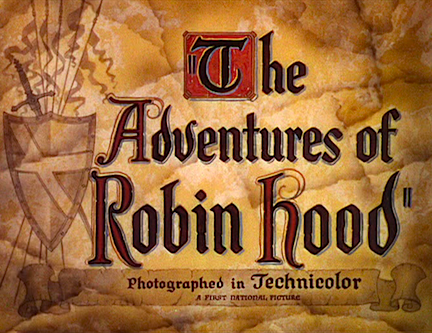 The Adventures of Robin Hood (1938) is famous for its Technicolor cinematography, but I first saw this classic in black and white on the old 21-inch Zenith television set in our New Jersey home. To say I was always movie-struck tells only half the story; I was the kind of kid who got up in the middle of the night to watch some ancient “B” mystery on the Late, Late Show. More often than not I’d fall asleep on the living-room couch, where my exasperated parents would find me the following morning. 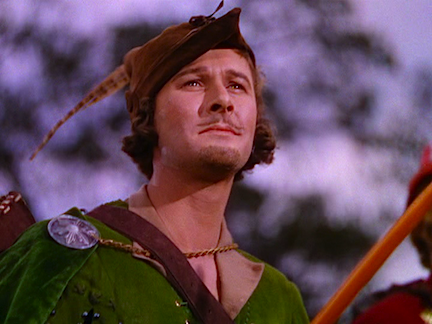 Of course, Robin Hood wasn’t a “B” movie and it wasn’t relegated to 2 a.m. airings; I remember seeing it frequently on Sunday afternoons in the Good Old Days before Cinemax, MOWs, and “reality” TV. Errol Flynn (above, making his first appearance in the film) was one of my favorite stars. I liked him in anything from his peak period as a Warner Brothers star, even to the extent of suspending disbelief when, English accent and all, he played a cowboy in Dodge City (1939). But there was for me always something special, something magical about Robin Hood. I couldn’t quite put my finger on it then, and I’m not sure I can now. Of course, today I can appreciate the film as one of the masterworks of Hollywood’s Golden Age. Technically, it’s beyond criticism. Aside from the obviously lavish production values — extending to the sets, costumes, and hundreds of extras — Robin Hood is superbly written, directed and acted. It won Academy Awards for Editing, Art Direction, and Original Musical Score (the latter by Erich Wolfgang Korngold and tied with Franx Waxman’s music for Bride of Frankenstein as my favorite score). It was nominated for Best Picture, losing to Frank Capra’s vastly inferior and now badly dated You Can’t Take It With You. Judged by any objective measure, Robin Hood rates top honors. But why does it continue to hold such a strange and wonderful fascination for me? I still don’t know. It’s not just the movie’s flamboyant, devil-may-care action, which thrilled me as a kid. 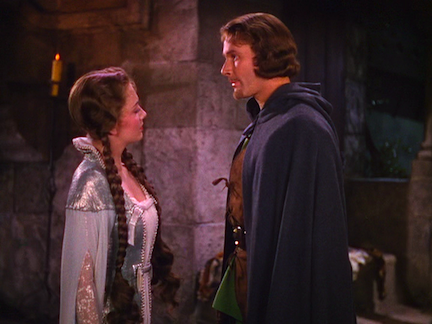 And it’s certainly not the romance, which I tolerated as a kid but appreciated more in later years, when I realized how gorgeous the young Olivia de Haviland (as Maid Marian) was, especially in Technicolor. Bear in mind, I qualify as what used to be called “an old softie.” Even now, so many years later, my emotions are easily stirred when I revisit favorite films of my youth. I’ve been known to choke up a little at the sentimental ending of a 1936 Hopalong Cassidy movie, Trail Dust, and that’s not something to which a grown man can safely admit without standing a good deal of ribbing — and I have, believe me. Robin Hood is filled with memorable moments. 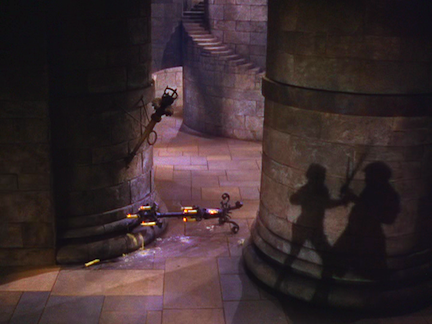 The first major action sequence — in which Robin impetuously barges into a banquet at the castle of his arch-enemy, Guy of Gisbourne (Basil Rathbone, in another exquisite bit of casting), and boldly challenges Prince John (Claude Rains), the would-be usurper who lusts after the throne of his missing half-brother, King Richard the Lion-Hearted — is marvelously, almost breathtakingly exciting. Even better is the lengthy Sherwood Forest interlude in which Robin and his Merry Men attacks Gisbourne’s supply train (carrying a fortune supposedly intended to ransom the imprisoned Richard from the King of Austria) as it passes through Sherwood Forest. During this part of the film Robin persuades Marian, the haughty Norman maiden, that he’s not a simple bandit. It’s difficult not to be moved by the outlaw’s declaration of love for England and his plea for tolerance and fair play from the ruling class. And then, of course, there’s the archery tournament, staged solely to draw Robin into Gisbourne’s clutches — another masterful sequence, capped by perhaps the most famous scene in the Robin Hood legend: that prize-winning shot in which his arrow splits one placed dead center in the target by a previous marksman. Oh, and let’s not forgot Robin’s subsequent rescue from the hangman, cleverly planned by Marian and executed by the Merry Men. Robin’s final duel with Gisbourne, which takes place during an invasion of the castle just as the usurper is about to be crowned, still rates among the most exhilarating exhibitions of screen swordplay, with Sir Guy getting his just desserts in suitably grisly fashion — yet another bravura sequence in a motion picture that teems with them. No doubt about it, the parts add up to a most satisfying whole. And yet, I still can’t isolate the thing or things that make The Adventures of Robin Hood so special to me. Earlier this evening, while channel-surfing, I came across the film on Turner Classic Movies just as the opening titles were rolling. I said to myself, “I’ll watch it for a few minutes until Flynn enters.” Then, after that scene had come and gone, I said, “I’ll watch it through the banquet sequence.” And then, “I’ll watch it through the ambush of the supply train in Sherwood.” And then…well, I wound up sitting through the whole damn movie. A movie I own on DVD and can watch any time I want. On an intellectual level I wish I was able to explain my love for this film. But I can’t, even though I’d like to. Yet I felt sufficiently moved to write this post and grab the DVD to pull frame captures I could use for illustrations. Robin Hood inspires me to such effort, even when I have better things to do (which, by the way, is certainly the case tonight). I’d be interested in hearing from those of you who find yourselves similarly affected by other movies. What are they? Can you articulate what it is about them that keeps you riveted time and again? I went through the exact same course of events tonight. “Oh, I’ll watch until Robin shows up.” Yeah, right. I watched from beginning to end. I love it because evil is vanquished. The good guys (and gals) have to be brave and fight for their happy ending. I can’t count all of the times I’ve watched it. I just know I love it every time. At first, I was going to write about two of my favorites starring Humphrey Bogart: THE MALTESE FALCON and THE BIG SLEEP. I’ve watched each one over a dozen times and love the film noir aspects and the acting of Bogart. But I also love CASABLANCA and TREASURE OF SIERRA MADRE, so that’s too many movies for this interestng topic. The one film that I keep watching over and over is an obscure western called LITTLE BIG HORN(1951). I first saw this Lippert Production as a kid in the 1950’s. It’s a black and white, low budget B-western with a great cast: John Ireland, Lloyd Bridges, Reed Hadley, Jim Davis, Noah Beery Jr, Marie Windsor, Hugh O’Brian. Directed by former pulp writer, Charles Marquis Warren. It’s about 15 cavalrymen who try desperately to warn Custer and the Seventh Cavalry about the Sioux indians gathering to ambush almost 300 cavalry. Needless to say, it is a hopeless task as the small troop start to get picked off one by one. Very downbeat ending and it qualifies as a western film noir, which is a combination of my two favorite genres(if I may be allowed to refer to film noir as a genre). What a coincidence. I just rewatched this last weekend from the 65th anniversary dvd I have. This film just never gets old for me and I have lost count of how many times I have watched it since my older sister Joan took me to see it when it was re-released in 1948. All the actors fit their parts so well from Friar Tuck to Will Scarlet. And did Olivia deHavilland ever look lovlier? Flynn is Robin Hood in my mind. Not to forget Basil Rathbone and Claude Raines. Treasure Island.The character of Long John Silver.His alternating between good guy and bad guy.I always felt i was Jim Hawkins.Saw it first as a kid and it has always stuck with me.That said Robin Hood with Flynn is a truly great movie. Hi. Can anyone put us in touch with Al Tonik? He might enjoy visiting online with my vintage pulp author husband Charles Boeckman, now age 91. Thanks.